This section of the user manual contains information about the preferences window. You can access the preferences window within Tune Sweeper by selecting 'View' in the main toolbar and then selecting 'Preferences'. The main toolbar is located at the top of the main Tune Sweeper window. 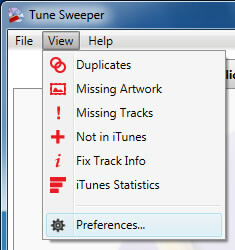 Selecting this will display the 'Tune Sweeper Preferences' window. The preferences window contains two different settings that you can change. 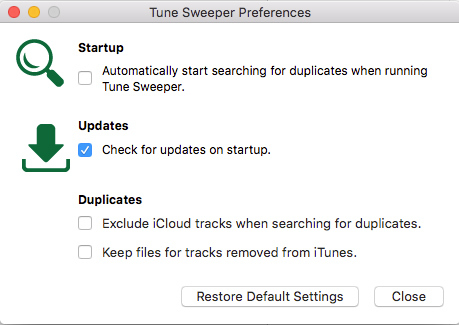 Start up - This setting allows you to set whether Tune Sweeper should automatically search for duplicates when you launch Tune Sweeper. Updates - This setting allows you to set whether Tune Sweeper should automatically check online for new updates to Tune Sweeper when it is launched. Duplicates - The two settings here are: to exclude iCloud tracks when searching for duplicates; and to keep the files for any tracks removed from iTunes. Note: Any changes to these settings will automatically be saved and applied. Tune Sweeper will remember any changes so that you do not need to keep changing these settings every time you run Tune Sweeper.